Origin and Habitat: Cuatro Cienegas, Mexico. Ribs: 8 sharp with a reddish edge. Spines: The 6-8 spines are striking strong and up to 8.5 cm long, flat, black to brown in the youth, later grey-chalky. 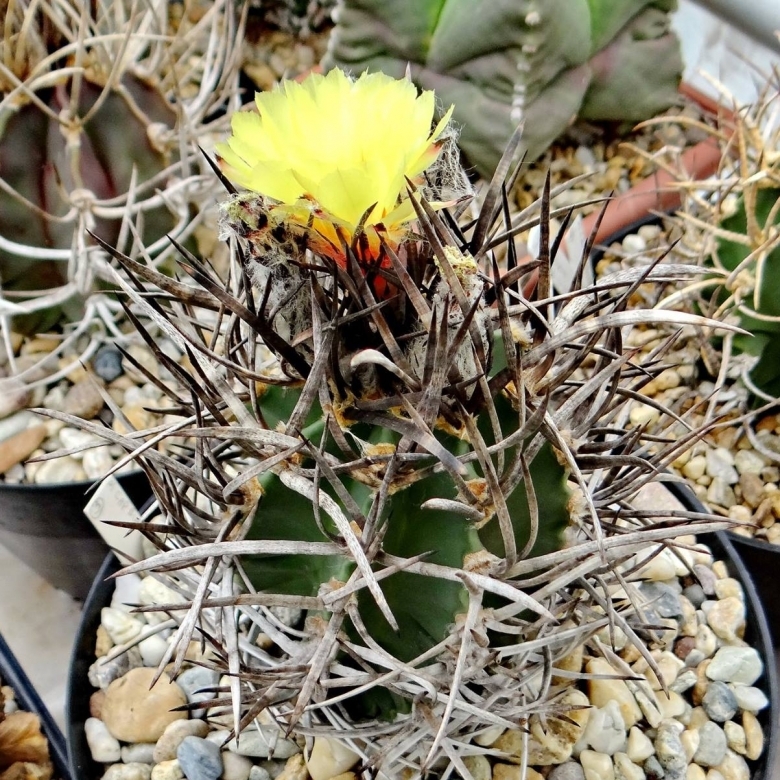 They are noticeably stronger, larger and thicker than in the common Astrophytum capricorne. 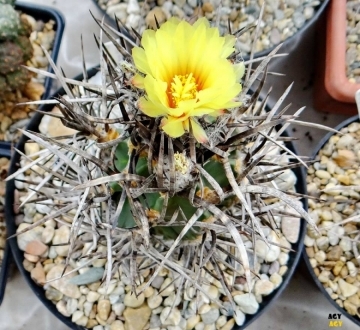 Yellow spined plant are also common in cultivation. 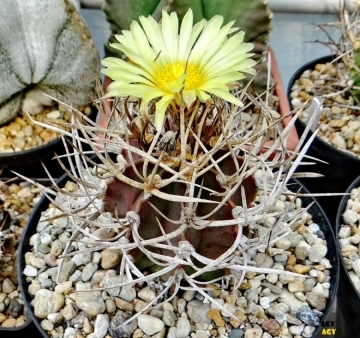 Flowers: The blossoms have a reddish eye as in Astrophytum capricorne var. niveum but pure sulphurous flowers are also mentioned . Remarks:'KIGAN' is a famous Japanese cultivar of A. capricorne v. crassispinum (the name means means 'monstrous'). Notes: The name "crassispinum" is however source for many confusions. 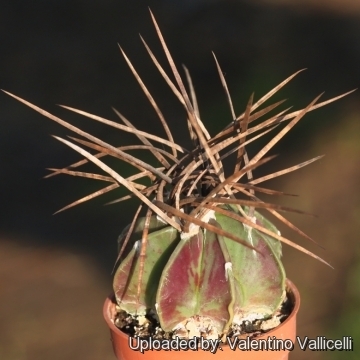 And also frequently these plants are mistaken with Astrophytum capricorne cv. Crassispinoides which is very different and has very thin and flexible white spines and pure yellow flowers. Cultivation and Propagation: It is a popular summer-growing species of relatively easy cultivation. 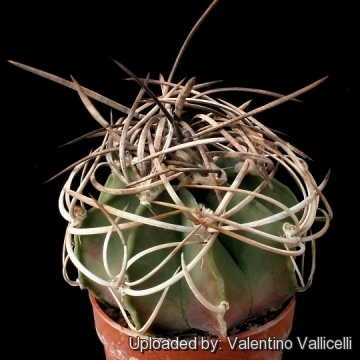 Soil: Grow it in an open standard, sandy-gritty cactus compost and provide a very good drainage. Exposure: It is suited for sunny-brightly exposure, but can tolerate light shade. However it will do its best with lots of sun and become stressed with inadequate light which could result in poor growth and unnatural shape. It has a good heat tolerance. Watering: Water regularly (about once a week) during the growing season and keep it completely dry during winter or when night temperatures remain below 10° C. Water it less than average if in bigger pots. Special need: It is suited for airy exposures. Provide very good ventilation. Nearly all problems occur as a result of overwatering and poor ventilation, especially when weather conditions are dull and cool or very humid. ere. Hardiness: It likes warmth (recommended minimum winter temperature 5° C) But plants kept perfectly dry can easily survive to light frost (it is reported hardy to -7° C for brief periods). Propagation: It can be propagated easily from seed (seldom produces offsets). The seeds can be sown in pots of fine, well-drained sandy soil, any time during the spring when temperatures are warm. Cover the seeds with a fine layer of grit and water from below with a fungicide to prevent damping off. For the 1-2 weeks cover the pots with a sheet of glass/clear perspex to keep the humidity levels high. Remove the glass and replace it with light shade-cloth and mist once or twice a day for the next two weeks after which most seeds should have germinated. From then on mistings can be reduced to every second and then every third day as the little plants grow. The seedlings should not be disturbed until they are well rooted after which they can be planted separately in small pots. Sometimes it is grafted to avoid root rot problems as plants grafted on an hardy stock are easy to grow and no special skill is required.